The tattoo industry has evolved since its early days. What was once just brandished by a select few has become a common sight across the United States. 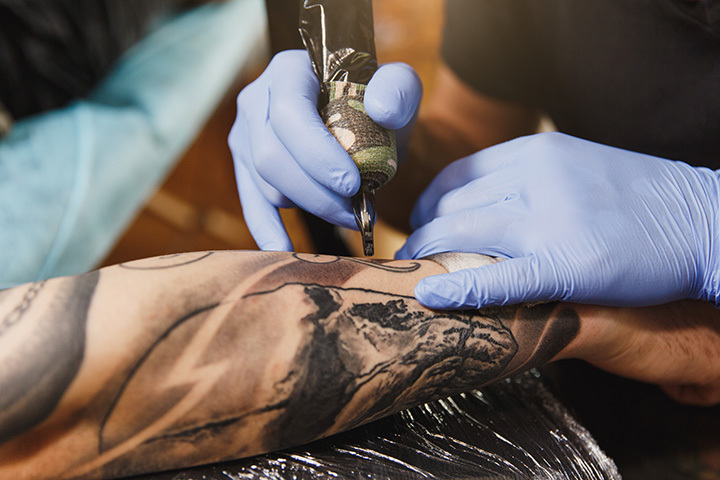 If you’re taking that first step in getting a tattoo or adding to your collection of body art, these 10 best West Virginia tattoo parlors are some of the best in the state for cleanliness, customer service, innovative design, and compliance to health and safety. From the moment you walk in the doors at Rock Lake Tattoo Company in Charleston, West Virginia, you’ll watch artists do what they love to do best. Known for being able to take an idea and turn it into expression, the folks here follow department of health rules and provide a clean and comfortable shop. STICK Tattoo Company is not your typical tattoo place. Priding themselves in representing the tattoo industry with integrity and strong core values, this Morgantown tattoo shop has some of the best artists in the area with specialties and techniques that have earned them “Best Tattoo Shop of Morgantown.” Besides a top-quality tattoo service, they also offer body piercing and provide clean, sterile equipment, private rooms, and knowledgeable piercers. They even offer gun-free ear piercing for minors and other piercing services with the proper paperwork. Since opening in 2009, Black Eagle Tattoo in Charleston, West Virginia, has been offering the best in customer service and satisfaction for tattoo art, related products, and body piercings. The clean and regulation-compliant studio is comfortable and the staff is friendly and knowledgeable. They can assist in bringing your design idea to reality, or take your design and make it work. This award-winning tattoo studio located in Charleston, West Virginia, puts customers first. Bare Knuckles Tattoos uses professional and licenses artists who can walk you through design conception to finished product. The studio features the artwork available and showcases work from around the world and local artists. If you want a clean, safe environment and assurance that the health codes required by the state are followed, visit Bare Knuckles or talk to one of the staff. Known as the area’s top choice for tattoos for over 15 years, Smokin Guns in Beckley and Fayetteville, West Virginia, takes great pride in decorating people. Appointments are suggested, but walk-ins are welcome at this clean and comfortable studio. First timers are especially appreciative of the friendly atmosphere. Reasonable prices, great work, and clean, comfortable surroundings are what you’ll find at Artistic Creations Tattoo in Dunbar, West Virginia. Besides offerings tattoo and body piercing services, they have artists who specialize in laser removals, custom tattoos and piercings, and cosmetic work. Minors can be seen with two forms of ID and parental or legal guardian approval. Don’t let the size of this studio fool you. The skilled artists will work with you to give you a great experience and a great tattoo. They also provide body piercing services in a clean and comfortable shop at affordable prices. Touch-ups are free. Very professional and helpful artists are what you’ll find at Thinkin Ink Tattoo Studio of Clarksburg, West Virginia. Many of them are award-winning, and provide knowledge and expertise in specialty areas. Open every day except Sunday and Monday, you can follow their Facebook page for specials and discounts. You’ll love the look and feel of the studio, decorated with black and white floor tiles and adorned with designs used in tattoos. Cherry Bomb Tattoo in Clarksburg, West Virginia, is the oldest tattoo parlor in the area and makes customer service and satisfaction a top priority. They can assist you in your next tattoo, body piercing, or cosmetic removal. You’ll feel like you’re around a group of friends.